Cross Border Orchestra of Ireland (CBOI) prepares for "Peace Proms"
The world renowned Cross Border Orchestra of Ireland comes to the Royal Theatre Mayo for two shows only at 3pm and 8pm on Sunday 13th February 2011. The Cross Border Orchestra of Ireland was established in 1995 as a means of bringing young people together from different backgrounds and communities, through the powerful medium of music. Composed of 130 young people from many parts of Ireland, the CBOI is one of Ireland's flagship peace initiatives and has become the most acclaimed youth orchestra that Ireland has ever produced. When the Directors of the CBOI launched their national "Peace Proms" project last June, they could never have anticipated such an over whelming response. The project objective is to give the young people throughout Ireland the opportunity to perform with a full symphony orchestra. The project focus is on providing outstanding cultural opportunities for young people while promoting peace, unity and tolerance through music. In addition, the CBOI provides essential musical education for 5,000 children in schools all over the country and often fills a void where no musical outlet exists. 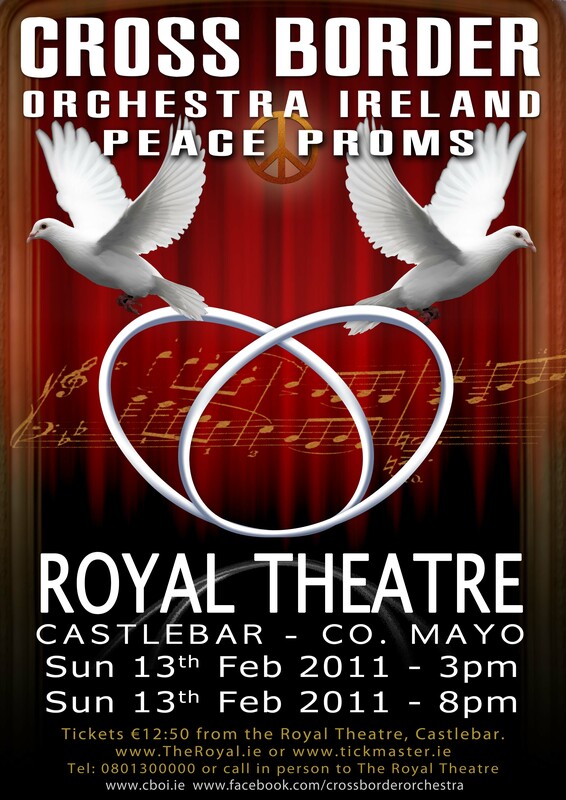 "Peace Proms" concerts will take place at top venues throughout Ireland including the Waterfront Hall, Belfast; the Helix, Dublin; Galway and Cork and comes to The Royal Theatre, Castlebar for two very special performances on Sunday 13th February 2011. Schools throughout Mayo are already ringing to the sound of music as teachers prepare their students to perform with the orchestra in this unique music project. There has been a wonderful response from schools in Mayo where over 1200 children from 36 schools will have the opportunity to take to the stage and be part of this very special performance. This project is supported by the Department of Education and Skills; the Department of Tourism, Culture and Sport; the Department of Foreign Affairs; Hilco UK; the Goodman Foundation; Louth County Council; Dundalk Town Council; Newry and Mourne District Council; Galway County and City Arts Councils; Cork County and City Arts Councils; Mayo Arts Council; Mayo Education Centre; Galway Education Centre; Cork Education Centres; Dundalk Education Centre; Navan Education Centre.